"A true Chicago icon, 175 E Delaware, also know as the John Hancock, is a world renowned building. Often, units with "no diagonals" are the most desired as those have views that are not obstructed by the famous diagnals on the exterior of the building. Also, some units feature a "sky terrace" - a small sun room separated by glass doors. None of the units have balconies." 175 E Delaware - John Hancock - is an iconic building of Chicago's skyline and one of the tallest in the nation. The 100-story mixed-use highrise is located at the northern end of the Magnificent Mile in the heart of Chicago's affluent Gold Coast / Streeterville neighborhoods. Building amenities include a 24-hour door person, exercise room, party room, an indoor pool, on-site restaurants and one of the best locations in the city with quick access to shopping, dining, nightlife and Lake Michigan. 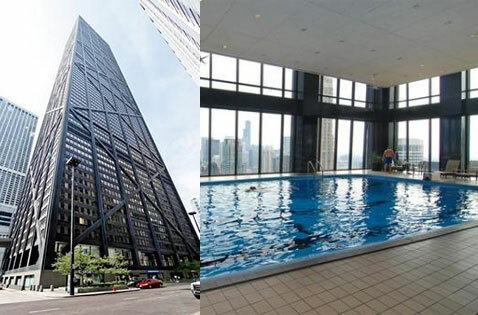 In addition to some of the best views in Chicago, condos in the John Hancock Center also offer a wide variety of floor plans and finishes for buyers to choose from. 175 E Delaware only allows cats - no dogs. Leased parking is available in the attached garage.